It brings together young companies, entrepreneurs and representatives of local institutions. The initiative aims to stimulate development and to improve the entrepreneurial ecosystem in host cities and to enable meetings and dialogue between entrepreneurs, educational institutions, the non-governmental sector, local administration and young people looking for support in starting up their own businesses. Startup Europe Week is in Bulgaria since the very beginning of the initiative in 2016. The third edition in Sofia continued three days at two venues - the Microsoft Innovation Center at Sofia Tech Park and MOVE.BG. The first two days the programme included the Bulgarian Competitiveness Programs of the Ministry of Economy and Services of the Executive Agency for Small and Medium-Sized Enterprises and the European Programs Erasmus + for Young Entrepreneurs, Enterprise Europe Network. Discussions focused on the main steps to become an entrepreneur from a legal, organizational, financial, business and conceptual point of view. Julieta Hubenova, an experienced project and business consultant and a former investment fund manager, stressed the importance of finding the right market for the new product or service. Societe Generale, an alternative form of investment expert, Mihail Komitski, said that time and resources had to be invested to reach a prototype before bank funding was made. Lawyer Bilyana Dimitrova advised the audience to be very vigilant when choosing business partners and the conclusion of shareholder agreements. 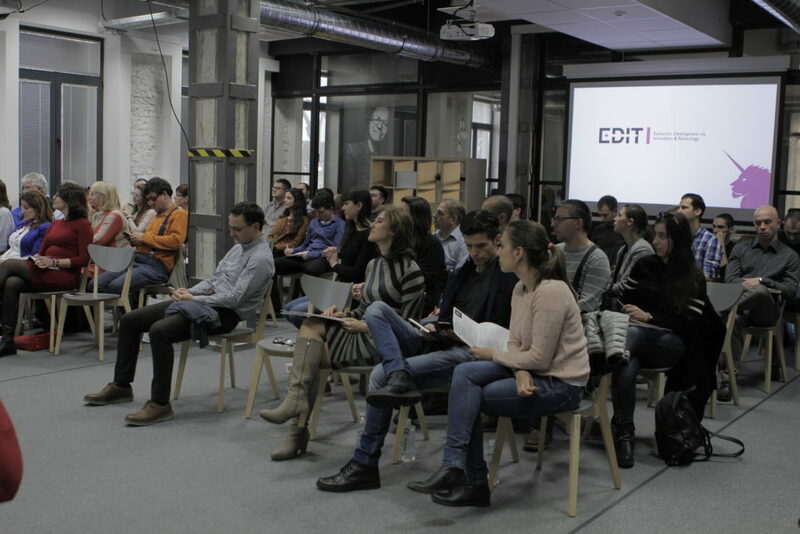 Representatives of the Fund of Funds, Endeavor, the Eleven Fund, the Bulgarian Venture Capital Association, the Founder Institute, Start It Smart, national EDIT network shared the opportunities offered to beginners and advanced entrepreneurs. Good examples of successful entrepreneurs in the program this year were Bulgarian companies with an international presence such as Roobar and ShopUp and Bulgarian solutions for social challenges like FoodChain, GreenBuz, SmartFabLab, "Zaslushai se"
The three-day marathon ended with the premiere of the first video promoting the Bulgarian startup ecosystem. You can find the video right here! Part of the program was also the presentation of the participants in the promo video - the media company Uspelite.bg, Dronamics, Printivo and OfficeRnD, whose founders talked about their first steps and the obstacles on the way of their business development. In Plovdiv Startup Europe Week also had its third edition. Traditionally, the event was organized by Stoyan Naydenov from the RISK Association and gathered more than 50 visitors in the Limacon area. SEW Plovdiv started with the story of Vladii Simov, co-founder of BGmenu, about his entrepreneurial path and key moments that would be useful to the attendees. Georgi Stoev from Industry Watch talked about the developing and growing industry in Plovdiv, which is thirsty for innovation and is looking for help from local entrepreneurs. The meeting continued with a lecture by Todor Breshkov, who spoke about the second fund Launchub, the BGMenu's exit, and the recent $ 1 billion worth of Romanian UiPath funding. Nikola Yanev, Eleven Ventures' new marketing director, ended up with a story about Eleven 2.0 and what they are looking for in entrepreneurs. He added that the application window is already open and the fund is looking for interesting companies. A positive phenomenon is that most of the attendees were coming to such an event for the first time and were asking if they would be organized yet. The lectures were mainly concerned with the directions in which entrepreneurs can focus and the hard work that requires it. SEW's first edition in Varna was as early as 2016 and was part of the global entrepreneurship pilot week. This year, 35 people came to in the Innovator Creative Space, founded in 2017, and after the inaugural speech by Igor Tasich, Phil Cruttwell and Ivor Riordan - English and Irish entrepreneurs revealed how they started in Varna, passed and shared their idea of ​​an English Club in the city. Then the entrepreneur Nikolay Petkanov delivered a lecture on the opportunities for small and medium businesses, different types of startups. Rousse is also one of the first Bulgarian cities in which SEW was organized in 2016. The Startup Europe Week 2018 event took place on 7 March at Angel Kanchev University of Rousse with local co-organizers and hosts - Faculty of Business and Management and Startup Association Factory. Deputy Mayor of European Development Dr. Strahil Karapchanski joined the discussion panel and congratulated the participants on behalf of the mayor of the Municipality of Rousse Plamen Stoilov. In front of the students, guests and young entrepreneurs, he presented the Municipality's Investment Program and the main priorities for development, in particular, the establishment of Rousse as a city of knowledge. "Traditionally, the University of Rousse creates an environment in which young people with business ideas get support and mentorship," said Svilen Kunev, a professor at the faculty host of the event. He also shared the opportunities offered by the Center for Entrepreneurship and the rich experience the university has and continues to build on in this area. Startup Factory chairman Emilian Enev formulated the core message of the event, namely the opportunity to present Rousse as a place where young people return, find inspiration and develop their own business. The event presented the initiative "The Digital Future of Rousse", formulating a strategy for the development of education and the local economy, using the opportunities provided by the new digital technologies; introduced the intense mentoring program Startup Basics to support the validation and development of well-defined start-up ideas; Examples of the Business and Management Faculty for entrepreneurship education in the digital environment were shown. More than 60 people took part in the first edition of SEW in Burgas, which started with a short introductory part, where the co-organizers from Start It Smart Burgas presented the initiative. The public sector was presented by Ivelina Shavova-Stratevа, Director of the Economic and Economic Activities Directorate of Burgas Municipality. She emphasised the role of Business Incubator Burgas for office space and the Regional Information Center, where start-up companies can get more information about state and European funding programs. Stamen Stamov, Director of Industrial and Logistic Park Burgas, announced the forthcoming opening of a Resource Center as part of the Park, which will prepare staff to meet the needs of high-tech industries. Stamen Stamov also expressed the Park's desire to support and interact with the entrepreneurial ecosystem in the city. Petko Georgiev, founder of ICT Cluster Burgas, for the first time publicly announces the upcoming initiative of ICT Cluster Burgas in partnership with the international company Deloitte, namely the development of a start-up acceleration program in Burgas. Startups were presented by Zdravko Genchev from MAXCART.BG, who told about his experience in venture capital venture from the Eleven venture capital fund and gave practical advice on how to present your idea to this type of investor. The co-founder of the online store platform also expressed his desire to mentor and help people with start-up ideas. In the end, Plamen Shkodrov from the association of programmers BurgasLab present NGO that is already five years helping to build a vibrant IT environment in Burgas. Programmers from BurgasLab are currently developing the Burgas Open API - a dynamic database of different metrics that will soon be open for use and will be entirely free for developers, entrepreneurs and all the enthusiasts who want to make decisions using this information. For the first time and Vratsa was part of the European Week dedicated to entrepreneurship. Host and co-organizer were Vratza Software Society, who for several years devoted themselves to turning the city under the Vola into a digital centre of the Northwest. The event was attended by 20 people who learned more about current funding opportunities for entrepreneurs. WonderSwamp co-founder Kalin Iliev told about his trip from Vratsa to the elite division of Mercedes in Brabus and the development of successful digital businesses. Tsvetana Ivanova from the Regional Information Center presented the public funding options for startup companies. The event ended with an active discussion about education, problems and opportunities facing local businesses. In addition to SEW's first edition of the city, Vratsa has also boasted a newly established accelerant for startups. It is the centre of the technology and entrepreneurial community in the city. Live about 20 people who learned more about the success story of a local entrepreneur and took part in the discussion on how to promote entrepreneurial thinking. In the question session, there was a keen interest in the entrepreneurs' experience with different VC funds, and curiosity was discussed as a chance to raise initial capital. The Executive Director of Regional Economic Development Agency Stara Zagora Rumiana Grozeva shared what is still lacking in the attitude of Bulgarian entrepreneurs to have an exit on international markets and to be competitive on a global level. Pavel Ivanov, one of SashiDo's co-founders, told for the long way from the idea to the busy business - from initial difficulties to successful meetings with potential investors. Veliko Tarnovo was also among the cities that hosted SEW for the first time. The event in the Ritual Hall of the Municipality gathered 30 representatives of the local business, non-governmental sector, students, freelance professionals and institutions. 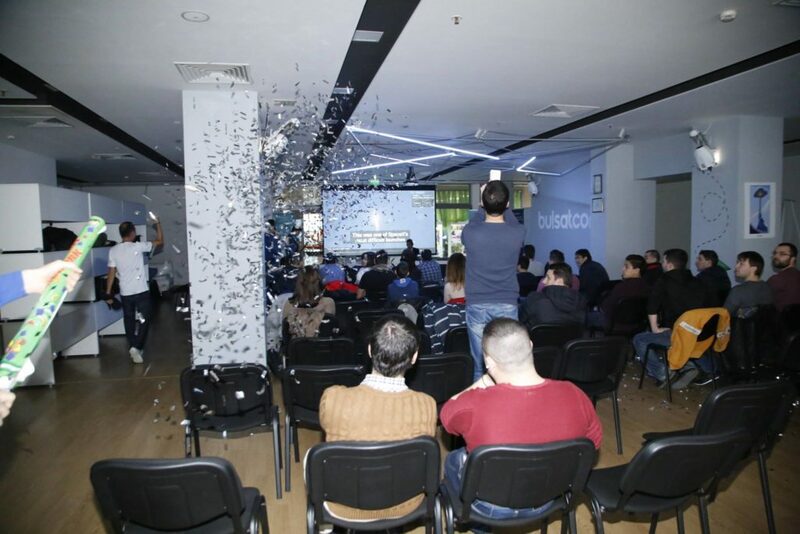 In the first part, Neven Boyanov from Veliko Tarnovo's Developer Club, Grigor Dimitrov from Start It Smart and Vanya Dimitrova from "We Succeed together" presented clubs and communities. Representative Pavel Hristov told about the opportunities for entrepreneurship and development of small and medium-sized businesses in the city and confirmed his willingness to support initiatives of local entrepreneurial communities. Guests in the second part of the event were Yavor Kiryakov from "University for Children", Gergana Markova and Todor Zahariev from "Interactive". Apart from his plans for Veliko Tarnovo, Kiriakov shared his personal story about the birth of the idea and the creation of the foundation in practice. 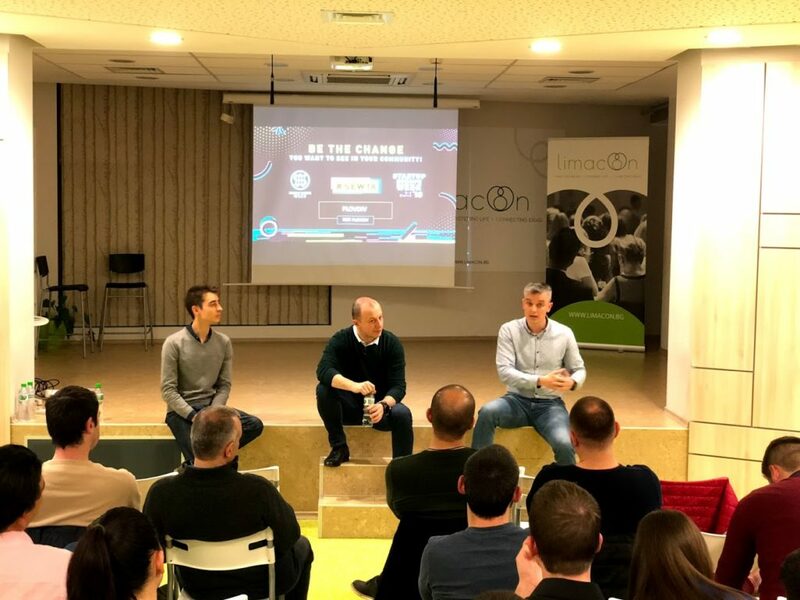 Markova and Zahariev explained how Veliko Tarnovo started an online gaming business on the global market, shared experiences and observations on career opportunities in Bulgaria. During the cocktail, conversations about the future of the city and the improvement of the business environment continued in a more casual format. Gabrovo became part of the European Entrepreneurship Week with an event held on 7 March 2018 at the Technical University. Organizer at the local level was the "Gradishte" Foundation. The event was attended by nearly 30 people, including students, lecturers, entrepreneurs and representatives of the local administration. Irena Boinovska of the Regional Information Center informed the participants about the opportunities for financing of small and medium enterprises, provided by the European funds. Georgi Stoev, co-founder of Industry Watch, presented his vision of Gabrovo as the technological heart of Bulgaria. According to him, the city should become an attractive centre for young people, entrepreneurs, freelancers and digital nomads. One of the first steps is creating a shared workspace, an initiative on which the Gradishte Foundation team is already working. FFW Regional Manager for Gabrovo Bozhidar Boshnakov told about his trip from 2013 when he worked in the company's office in Sofia until 2016 when he became a manager. He proposed to open an office in Gabrovo and the headquarters placed trust in him, so he returned to his hometown. Two years later his team consists of 25 people. According to Bozhidar, the secret of the excellent teamwork is employees to be proud of what they do in the company. Among a number of valuable suggestions from our partners, we chose to honour the most inspiring ideas and projects that our team felt closest to the fundamental values of MoveBG.